Cauliflower Fried Rice | Yikes! No Carbs Please! I’ve got so many things to write about, there’s a backlog building up. Today, I’m going to do a quick post before I forget. 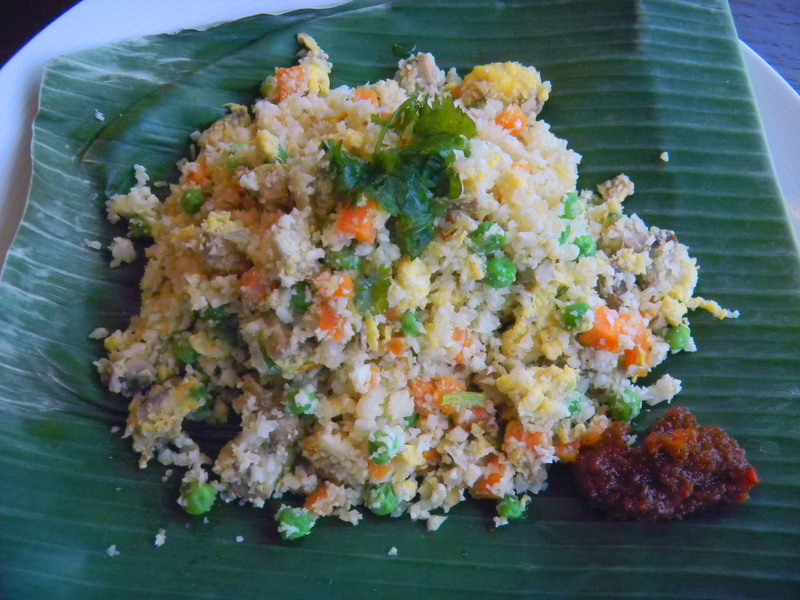 In my blog post of 7 May 2010, I said that I would post the recipe for my cauliflower fried rice when I next made it. Although I’ve had Cauliflower Fried Rice several times since then, I just noticed that there is no Cauliflower Fried Rice recipe in my recipe index. Well, I’ll have to make good on my promise. As I mentioned earlier, it is so simple you don’t really need a recipe but for those who are unsure, here is one. We had Char Siu Fried Rice today because I had some Chinese-style roast pork (called Char Siu in Cantonese) in the fridge but you can use any meat or tofu. Char Siu is sweet. It is pork basted with a marinade made of hoi sin sauce, honey and sugar and then roasted! I make my own marinade using less honey than called for and erythritol. If you want to avoid using a sweetened meat, then just use raw meat or tofu. Fried Rice, whether with cauliflower or rice, is such a versatile dish. Cook it to use up leftovers in your fridge. Cauliflower Fried Rice is even better. You don’t need to cook your rice and leave it in the fridge overnight. That is the secret to good fried rice. Since you don’t have to pre-cook your cauliflower, you can whip this up very quickly. First, rice your cauliflower. I usually use about 130-150 gr cauliflower per person, more than I would if I were eating cauliflower rice as an accompaniment. Here the fried rice is your main meal. Wash and cut the cauliflower into pieces and chop them in a mixer till fine but NOT MUSHY. Set aside. Heat some oil in a wok over medium heat. If you are using tofu, I would stir fry the tofu at this stage till lightly brown. Just put them in one layer spread out over the base of the wok and when they turn lightly yellow brown underneath, flip them over and brown the other side. Remove the tofu to drain on a paper kitchen towel. If you are not using tofu, just heat the oil and stir fry the shallots till glazed. Add the carrots and fry for a couple of minutes (till about half cooked). If you have chosen to use one of the raw ingredients, put this into the wok now, sprinkle lightly with salt and pepper and continue stir frying till your added ingredient is cooked. Be careful with the prawns though, they cook fast and tend to get hard if cooked too long. Then add the peas. If you are using cooked meat or have fried the tofu above, add this and the peas at the same time. Stir fry for about 2-3 minutes. Push the mixture up around the sides of the wok to create a little space in the middle. If this ‘little space’ in your pan doesn’t look oiled enough, add a teaspoon of oil and pour in the beaten eggs. I do this in two batches so that the egg gets cooked in a thinner layer. When the egg looks like it has set, scramble it with your spatula and break up into little pieces. Repeat the procedure with the second portion of your beaten egg. By this time, your meat and vegetables should be fully cooked or almost done. You’ve got 3 minutes to go! Now put in the riced cauliflower, add salt and pepper, stir to mix, cover your wok and let it cook for about 3-4 minutes. Stir again, adjust the seasoning using soy sauce or just salt. Tip: I sometimes throw in corn or zucchini cubes. The corn makes the fried rice more colourful!